The Bullseye® Urine Culture System consists of a specially designed multi-chambered agar plate that is used for the isolation and presumptive identification of many common pathogens. Each five-sectioned Bullseye® plate has three chambers containing selective agar media (Levine EMB, XLD, and Citrate) and a fourth chamber containing non-selective TSA (blood) agar. A fifth chamber houses Mueller-Hinton agar for antibiotic sensitivity testing by the disc diffusion (Kirby-Bauer) method. Following incubation, each inoculated plate is analyzed using a color flow chart. 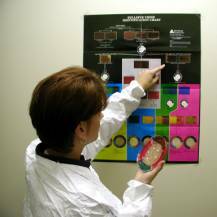 The combination of growth pattern, color reaction, and colony morphology are then used to determine the species of bacteria present. (See an example) Antimicrobial susceptibility is measured by observing the zones of inhibition on the Mueller Hinton portion of the plate. Bullseye® Urine Plates are packaged in boxes of 10 along with disposable inoculation loops and report forms. First time users should order the special Bullseye® “Intro-Pak” which includes the interpretative wall chart, antibiotic sensitivity overlays, a selection of antibiotic discs, two control cultures for staff training, and instructions. ** Additional requirements: Small (37°) incubator, additional antibiotic sensitivity discs, 6 or 8 place automatic disc dispenser.